The impression when first arrived at the international airport struck great resemblance to the Paro airport and Bangalore airport that I knew about 10 years ago, when you would meet whoever receiving you only after you stepped out of the airport. 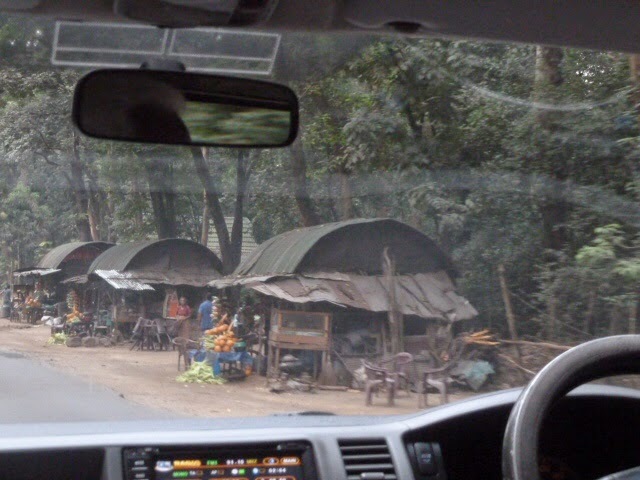 On the other hand, shops lined up along the way from immigration point to the baggage collection point. An interesting observation, most of the shops sell electronics like TV sets. 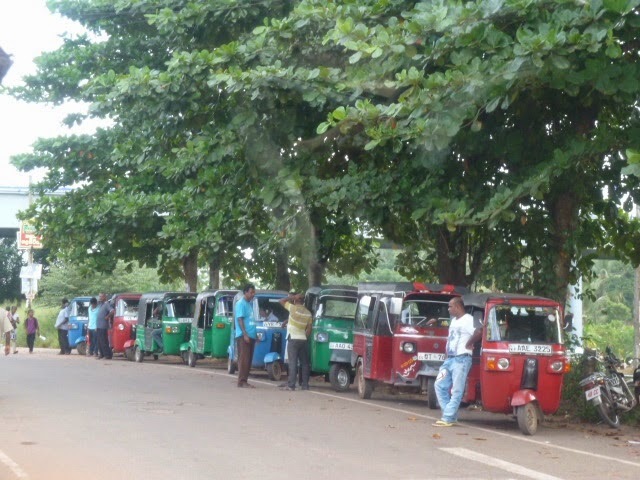 The roads were filled with tuk-tuks, very similar to Thailand! 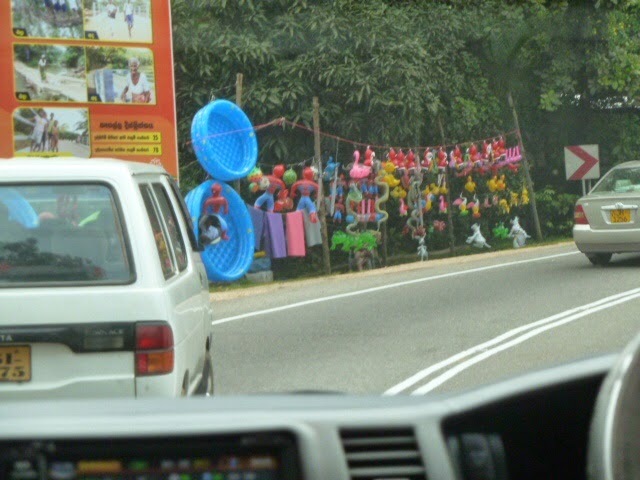 Along the way, by stretches of road, there are shabby huts that service as stalls to sell fruits, toys, etc each stretch has its own theme. Amongst the fruit stalls, bananas and king coconuts are most common! 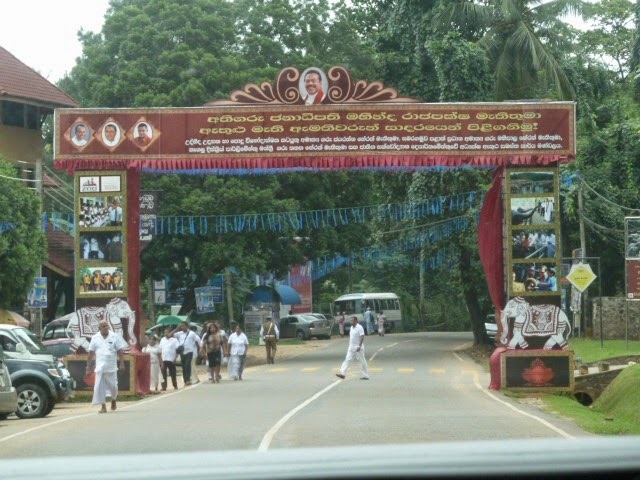 Along stretches of road, strings of blue ribbons cutting across the roads was a common sight. 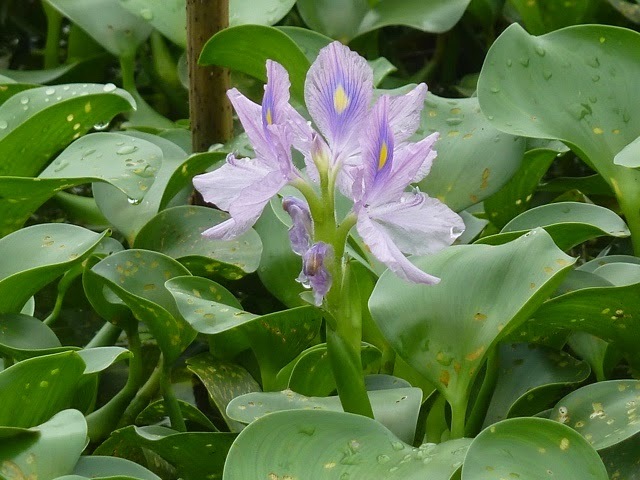 While lie predominates most of the stretches of road, there were once in a blue moon, other colours such as green and purple. According to the guide, the strings of ribbons showed the support that was given to the party that takes part in the upcoming presidential election on 9 January 2015. 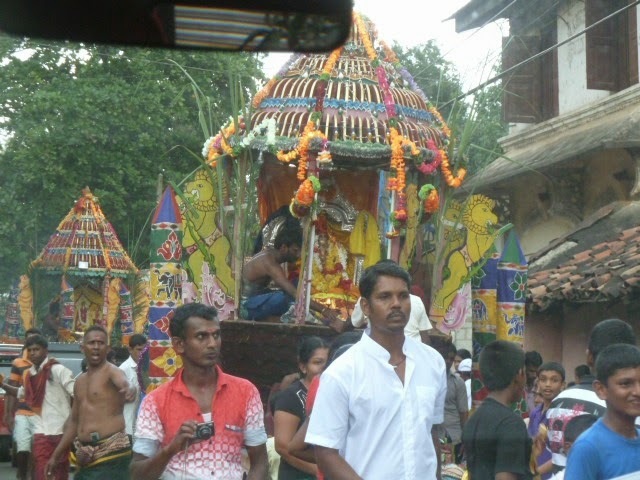 Buddhism plays an important part of the Sri Lankan culture, Poya is a monthly festival that takes place opinion the full moon day. It is declared as a public holiday when schools are closed and shops can close to allow people in the business to devote the day to religious activities. Non-religion related ntertainment activities are suspended in this day, too. 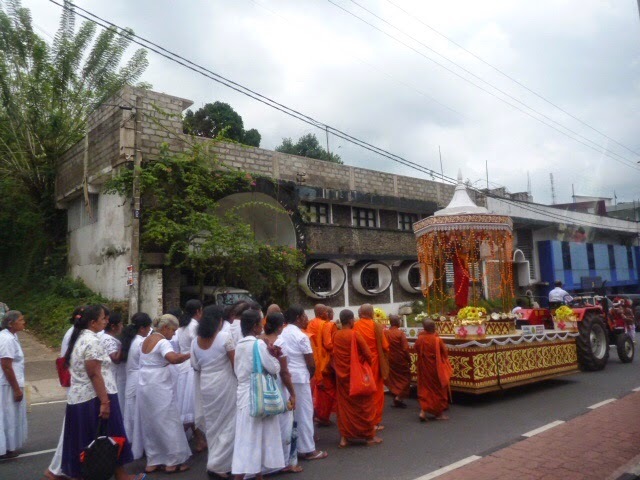 It was a coincidence that we arrive on the Poya Day where we observe some processions taking place on the street. Highlights of Day 2: It's adventure day! In the morning, the itinerary was a visit to a village to learn how toe locals live in the past (in mud houses, etc). 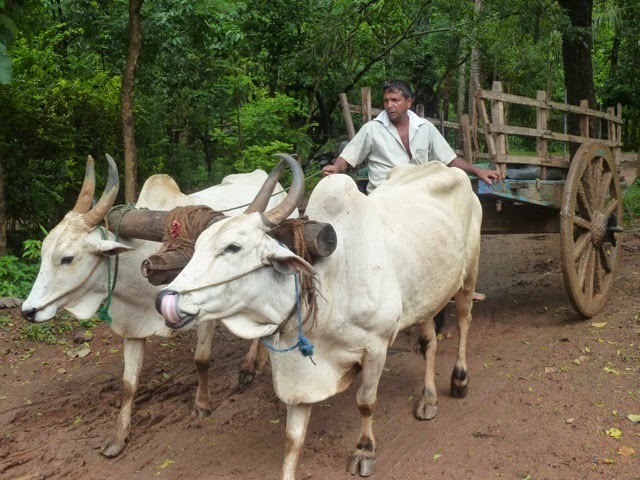 However, I think the highlight was not so much about the visit but the various means of transport we took to reach and return from the village. 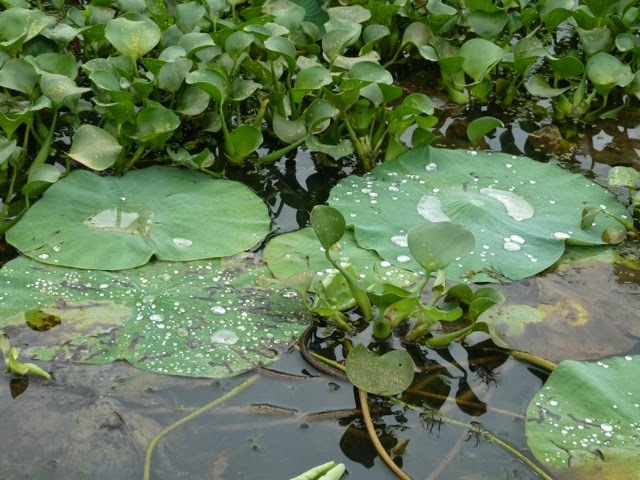 On the other hand, the lake was quiet and charming, with clusters of lotus leaves and water hyacinths on the calm surface, occasionally, we chanced upon some beautiful lotus flowers and dragonflies! 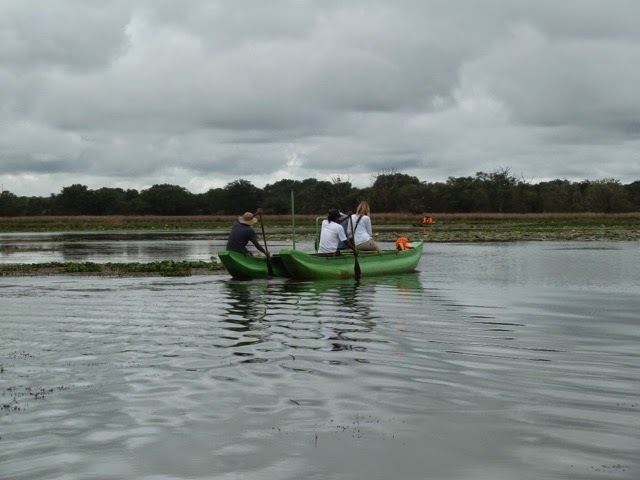 Birds flew across the surface occasionally - Pelicans, Eagles, and yes, the small kingfishers! Ok, amongst all, it's the least exciting but probably the safest amongst the three, though 3 people were packed at the back seat, behind the driver. 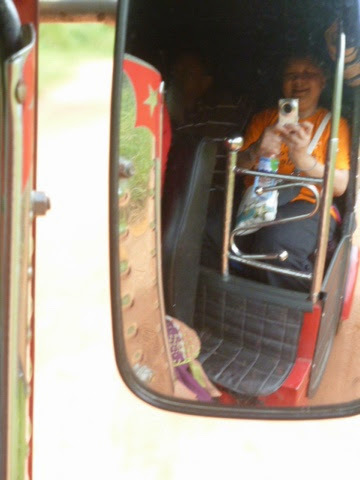 The day ended with the most unforgettable jeep ride in the safari, compared to the ones we had in South Africa. The search was about the elephants. It started with some shine that very quickly turn into dark clouds and rain as we drove deeper into the safari where the jeep ran along muddy uneven paths when most of the time, we neede to hold tight to the railings, fearing that we might be thrown to the mid-air inside the jeep! 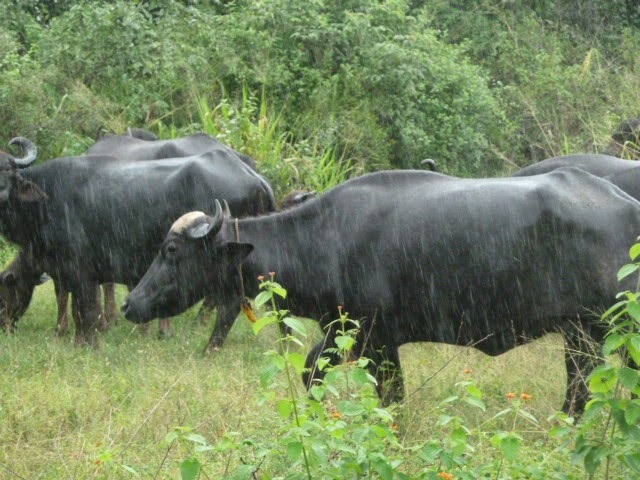 We saw big herds of buffaloes that stood still for the pictures despite the rain. I guess they must be so used to it. 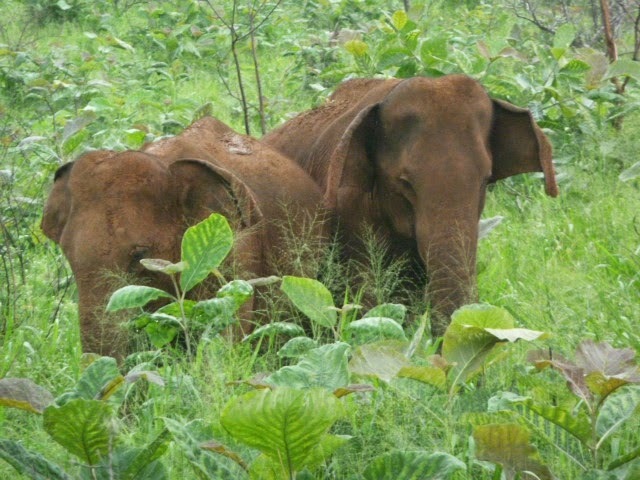 At last, we saw 5 "brown" elephants and we were told that the brown colour stuff were the mud on the body. Ok, they were not brown after all! The world heritage site, The Golden Temple, is the key highlight of the day. 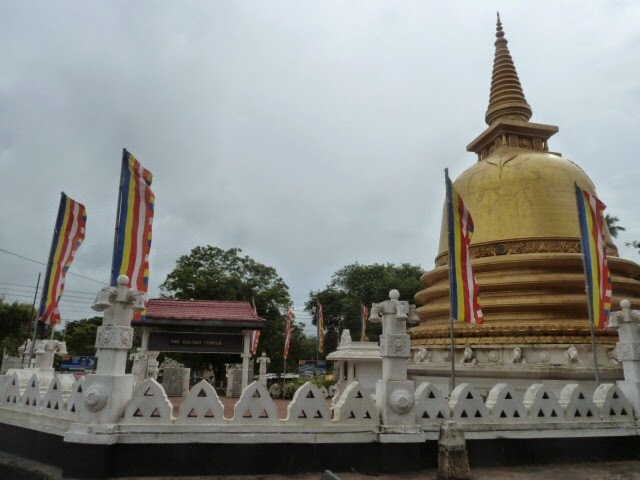 It is also a journey to learn more about one of the world's oldest religion - Buddhism. 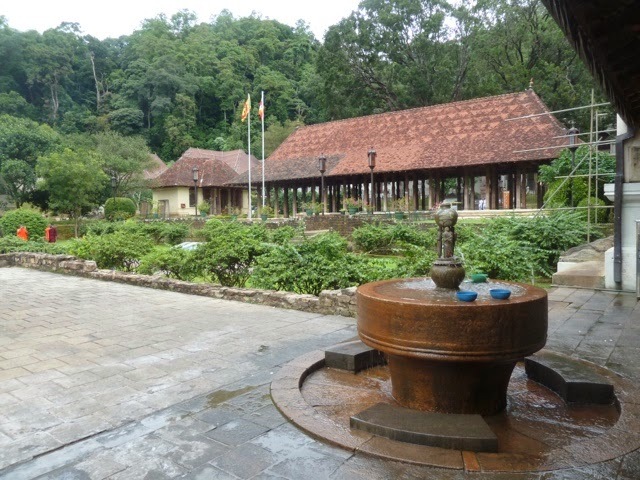 The Golden Temple, more commonly known as the Dambulla Caves, is made up of 5 caves, filled with wall paintings & sculptures dated back about 2000 years ago. While part of the paintings and sculptures were touched up, many are still in their original state. I guess, it's these untouched aspects that creates the sense of time and value of this place. The work by people of the past is remarkable! This is one of the sacred places where we see people don in white streaming in to worship at the "modern" building, which is currently in use for rituals and worship. The caves are actually at the back of the modern facade that requires some effort to climb. When arrived, all are to remove our footware, which I think it's not about keeping the place clean, I vaguely recall (reading from somewhere long long ago) it symbolizes equality, all worshippers are equal before the eyes of Buddha. 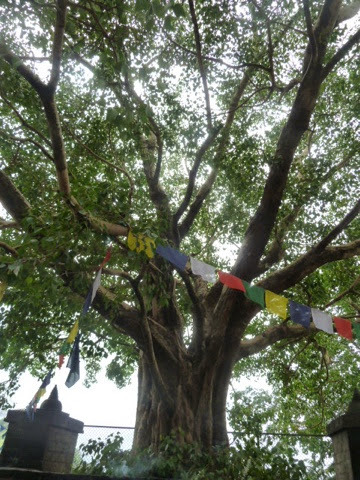 We are greeted by a bodhi tree that's more than 2000 years ago. According to the guide, a bodhi tree has to be planted at the site before the temple is built. The sight of the colorful prayer flags reminded me of a common sight in Bhutan, where the locals believe that the wind will send their prayers and would be heard. 1. In each cave, we find a gigantic lying Buddha statue and they were carved out from the cave stone. It's amazing work! There are also statues of smaller sizes carved out from sones and wood, and were covered with clay to give the colours on the statues. 2. The various positions of the hand and arm means different things. E.g. Right palm facing out is the blessing position, Right palm facing left is the teaching position. 3. All Buddha statues, no matter what state or position always have the eyes open, at varying degrees. 5. The feet of the Buddha were flat, and he did not have lines on his palm or foot surface, but lotus symbols, that was why one of the wiseman foresaw that the young prince would change the world. 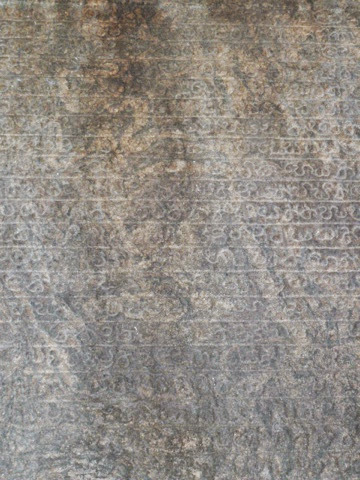 Here's a text sculpture in Pali, a "transitional" language from Sanskrit to today's Singhalese language. 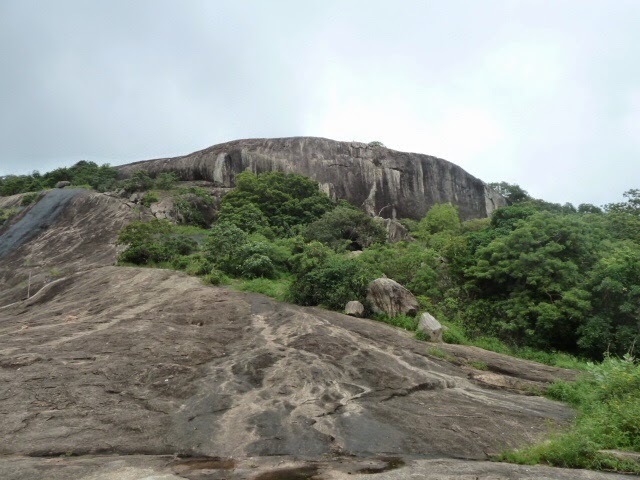 This is another world heritage site near Dambullah, nevertheless we only saw it from a distance as the climb to the rock would be a challenge. 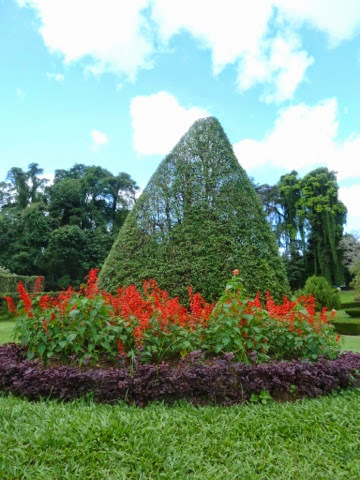 It's historical value dated back to AD477 where the ruins of the palace was still there. 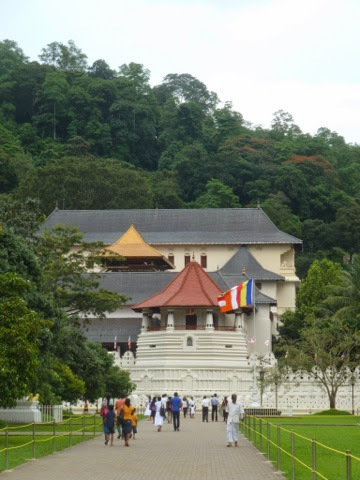 The temple is one of the most sacred religious places in the country as it houses the Buddha's tooth relic. The golden roof temple is situated in the palace. One section of the palace where the subjects sought the kig's audience. Foreground - where people clean themselves before adjourning to the temple. 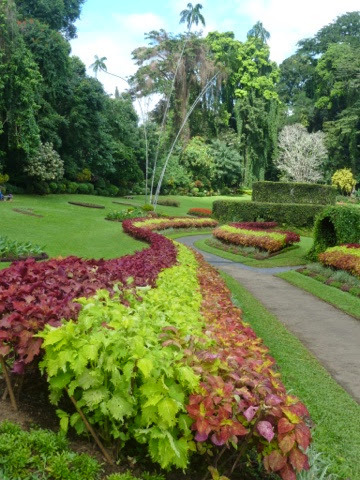 This is one of the famous landmarks in Sri Lanka that the guide proudly shared that Queen Elizabeth remarked that it was the most beautiful botanical garden that is 2nd to none. Hm... The visit was more than 50 years ago. 1. 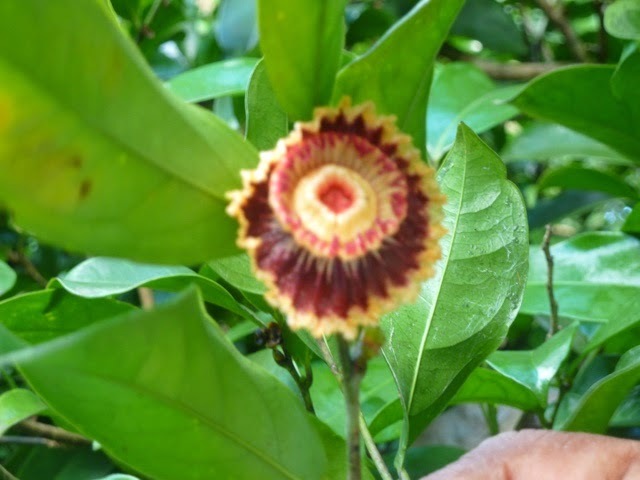 This is the flower of the "Crown of Napoleon"
2. 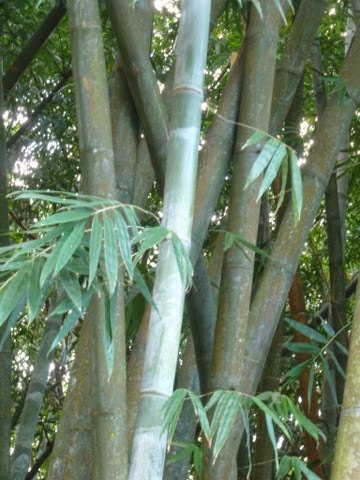 Here's the bamboo that grow about 35 cm per day before it comes to a steady height. 3. 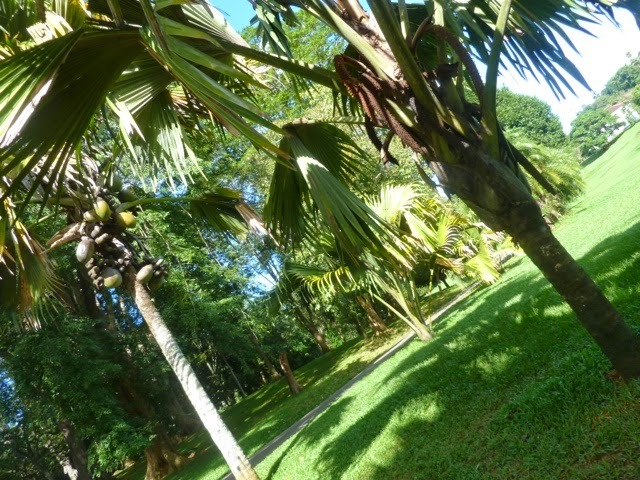 A female coconut tree that bears fruits with the male coconut tree deliberately planted beside it, to aid pollination by insects. 4. 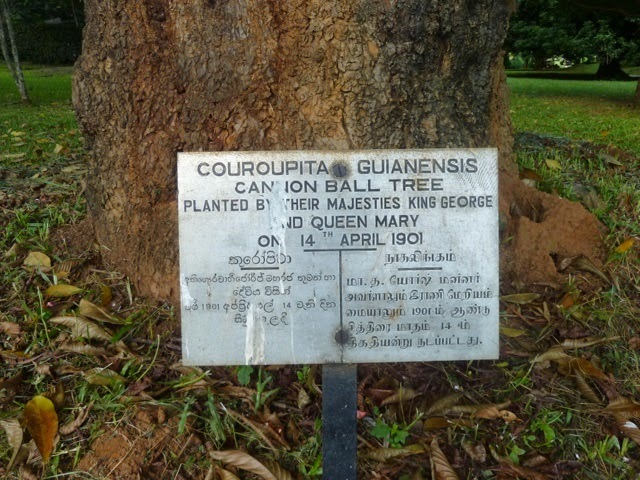 A tree planted by the British royalties. 5. 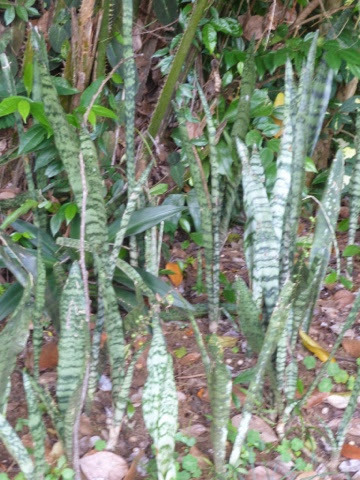 Here's the "mother-in-law tongues"
Sri Lanka is a very 'old' country with its history dated back to more than 3000 years ago! So, do we expect to find historical footprints as we do in other countries? 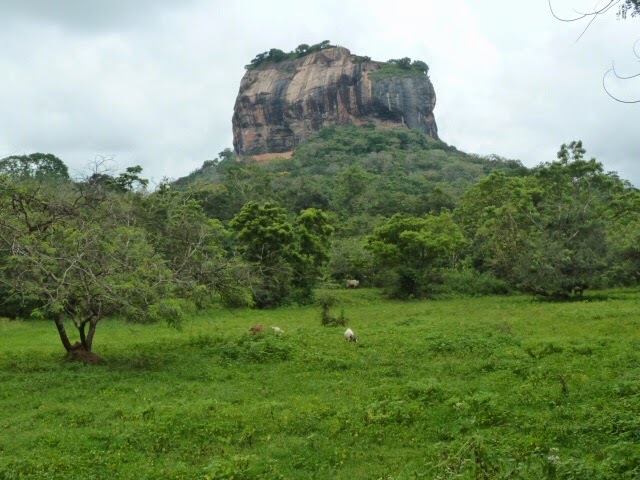 What would people associate Sri Lanka with today?